(AP)Hollywood stars always make headlines when their handlers send them to a far-off location to kick an unhealthy habit, but it turns out they’re not the only ones. 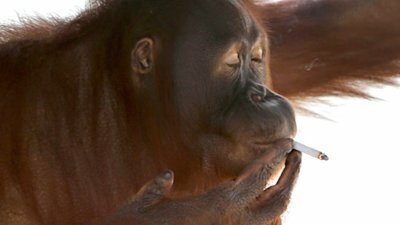 Grabbing headlines now is Tori, a 13-year-old orangutan who has been sent by her keepers at Indonesia’s Taru Jurug Zoo to a deserted island in the middle of a lake within the zoo in order to kick her smoking habit. Tori, one of four orangutans at the zoo in the Central Java town of Solo, picked up her love of cigarettes from humans who would throw their discarded cigarette butts into her cage. I know when I was quitting smoking ,I felt like at times I would go ape. I guess I wasn’t the only one. I wrote this awhile ago but decided not to publish it. I wrote it when I was angry at the supreme court decision. It has been siting here on my computer all this time. When I just read it again today, I still feel the same way. I don’t like the way are country is going under Obama’s Presidency. Today I decided to post it any way. I have lived quite a few years in this country (all my life) and I have seen many many changes over all those years. I can remember when a cup of coffee was a nickel. You can get into the movies for little to nothing. Gasoline was less than a dollar and I would drive around town to find a cheaper price because I felt a dollar was to dam high. Now I drive around the country in a forty foot diesel pushing motor home and have paid as much as $ 5,00 a gallon. I’m feeling darn lucky when I can find it for less than $ 4.00 a gal. That was then and this is now Obama Care is already costing me money on medical premiums. So you can see that I was pretty upset with the supreme court when the decision came down. — I’m not sure when I wrote the next part but I bet you can figure it out. I can’t believe that the supreme court upheld obama care. This is the biggest piece of junk on the American people there ever was. The obama group changed the mandate to read taxes. So now people are not only going to pay higher medical costs plus they are also going to pay more taxes on top of that. This is socialized medicine in it’s grandeur. Professor Patrick Pullicino a consultant to East Kent Hospital in England persuaded the hospital to resume treatment on that man. England as the article went on to say, that they are going to stop doing non-urgent surgeries which include hip and knee and cataract surgeries normally these are mostly affecting older people. Like the 71 year old above. Under Obama Care there was suppose to be a board to deem who would be aloud to get what surgery. This is what Obama care is going to be, socialized medicine. I’m retired and pay quite a bit for our medical insurance each month so I can move around the country without restrictions. No HMO. Who knows are we someday going to have to have a passport to go from state to state. One day at a small beach town, we were eating lunch dockside. Then OMG this huge yacht appeared at the dock. Talk about DREAMING!!! No matter – there dam good. WE were traveling South on I-15 out of Utah and stopped to rest and grab a cup of coffee for me, when I spotted the Flag. It look kind of neat the way it was waving in the wind,I was hoping the wind would let up just a little so I could get this shot. Well the wind did and I got my shot. We headed the motor home south again for Las Vegas,NV and took off.